Working from home affords you flexibility, but it also demands a lot from you in return. Jobs that let you work from home have unique requirements. Imagine: Your office chair is your couch. Your commute is the length of your hallway. Your snack drawer is your entire pantry. Think it’s a dream? Not always. Jobs that let you work from home, an arrangement known as telecommuting, are all the rage these days. According to a 2017 Gallup survey of more than 15,000 working adults, 43% of respondents said they spent at least some time in 2016 working remotely—four percentage points higher than in 2012. Not only are more people working from home, they’re also doing so more often: Of those surveyed, 31% worked from home four to five days per week, up from 24% in 2012. “Working from home is more and more of a hot topic because of how tight the marketplace is,” says Dawn Fay, senior district president for Robert Half, a recruitment and staffing company. One winning way companies can compete for top talent is by luring would-be employees and retain existing ones with creature comforts. 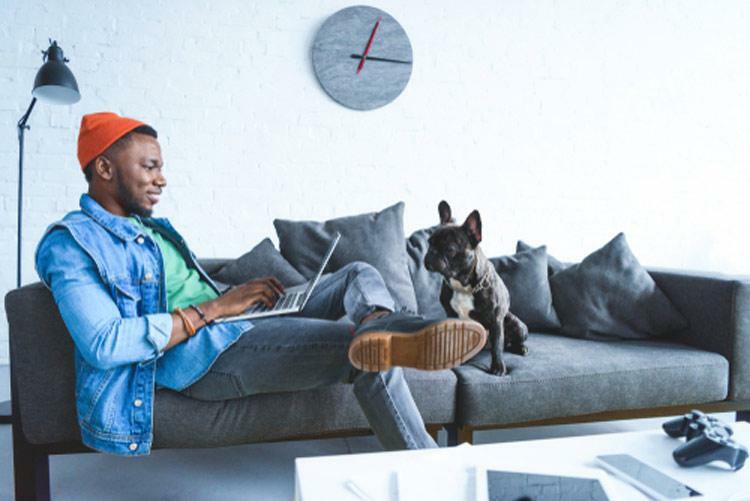 “Companies will do all sorts of things to entice employees, including offering flex time and work-from-home options,” says Fay. Indeed, according to a survey by Robert Half, 77% of workers said they’d be more likely to accept a job if it offered the ability to work from home at least some of the time. Or course, while working from your couch (or bed) sounds great in theory, like everything else, it’s important to understand the pros and cons before you start picking out home office furniture. In fact, 81% of workers in the survey admit there are downsides to working remotely. You are truly independent. It’s much more than just the allure of getting to work in your pajamas. Working from home means you’ll learn to rely on self-motivation, self-discipline, focus, and concentration. You can get more work done. As long as you’re not sneaking off to yoga class and hitting the mall, you can actually be more productive when working from home. “For starters, the remote worker isn’t spending hours commuting,” says J.P. Giugliano, partner at talent acquisition firm WinterWyman. In fact, when Giugliano works remotely, he says it adds three hours of stress-free productivity to his day. Plus, you won’t have the occasional annoyances of office life: interruptions, loud co-workers, chatter, et cetera. You’ll become a communications expert. When having a quick meeting in the break room isn’t possible, you have to get up to speed on what communication tools are available, says Fay. “From texting, Skyping, emailing, web meetings—out of necessity, you become very savvy in all of those.” In today’s digital world, knowing how to navigate these technologies makes you more marketable. You may forget to clock out. While people might think working from home means doing less, the opposite might be true for diligent employees. “When you don’t have that separation of going to and from the office, your workday kind of blurs together into your home life,” says Fay. Feeling like you’re always “at work” could even lead to burnout. You can feel out of the loop. You might not realize it until you’re not there, but there is a lot of casual collaboration that happens in an office, says Fay. Whether it’s picking up on the best practices of your colleagues or having an impromptu brainstorming session over lunch, it’s hard to replicate that from home. You might not have full access to technology platforms. For the most part, cloud technology has made it easier than ever for remote workers to work from anywhere. However, Fay notes that there are situations in which data security or consumer protection concerns might prevent telecommuters from having full access. The next best thing? Pick up the phone to congratulate someone after a job well done, or the completion of a project rather than sending an impersonal email or IM, he adds. Keep it professional. Even if you don’t have a dedicated office, try to set up a workspace and make it off limits to the rest of your household while you’re working. There’s nothing worse than being on an important work call only to have the doorbell ringing, the dog barking, and the kids screaming in the background, says Fay. Be responsive. Get in the habit of sending a prompt reply whenever you get an email, even if it’s just to say, “Got it,” or, “I’ll get back to you by noon,” says Giugliano. And, do your best to be available for conference calls or other collaborations, even if you don’t have strict work hours. Set specific touchpoints with your team. It’s smart to set a time each day/week for regular check-ins with your manager and/or your colleagues, says Fay. That will not only help you stay accountable, but it will also remind your office counterparts that you’re still an important part of the team. By entering into a work-from-home situation with the right mindset—knowing you may actually be putting in more effort than before—you can do a great job and enjoy the benefits that go along with it. Could you use some help achieving that balance? Join Monster today. As a member, you can get career advice and strategies sent directly to your inbox. Whether you’re working on-site or at home, Monster’s experts can show you the best ways to get the job, excel in the job, and advance your career.